Altitude Air Pvt. 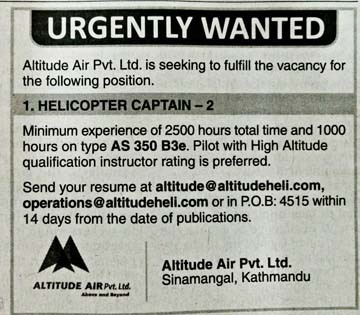 Ltd. is seeking to fulfill the vacancy for the following positions: HELICOPTER CAPTAIN-2. Minimum experience of 2500 hours total time and 1000 hours on type AS 350 B3e. Pilot with High altitude qualification instructor rating is preferred. Send your resume at altitude@altitudeheli.com, operations@altitudeheli.com or in P.O. Box no. 4515 within 14 days from the date of publications.